Soukup Graphic Programming Systems - learn to program with us. We implement a systematic teaching of programming in schools K-12. New! New international programming contest Junior B3. This contest is dedicated for beginners, middle advanced and advanced programmers aged 6 - 19 years. There are several tasks in the contest. Programs are automatically evaluated and the student immediately see his/her results within the school, district, regional, national and internationally. Let your students to try this contest. SGP Balties are very attractive professional programming teaching tools for all beginners and middle advanced programmers. These tools are graded for wide range of age 3 - 99 years. The beginners can use an interactive mode and the graphic icons instead of text commands, advanced users can use the C# text commands or combination of icons and text commands. Our little magician Baltie can help you to become a creative professional programmer. Really! 1. Watch the 5 minutes tutorial - "What is the Baltie?" 2. Try Baltie 3 yourself - "Baltie Trial" to learn more about Baltie 3 in 20 minutes. 3. Try our contest platform Baltie.NET, the Junior B3 for beginners. 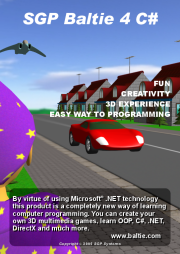 If you want to create your 3D games or learn C# - explore Baltie 4 C#. Multimedia programming teaching tool for children. It is suitable for beginners who want to understand programming concept and easily create multimedia program without text writing. Source code = graphic icons + literals. 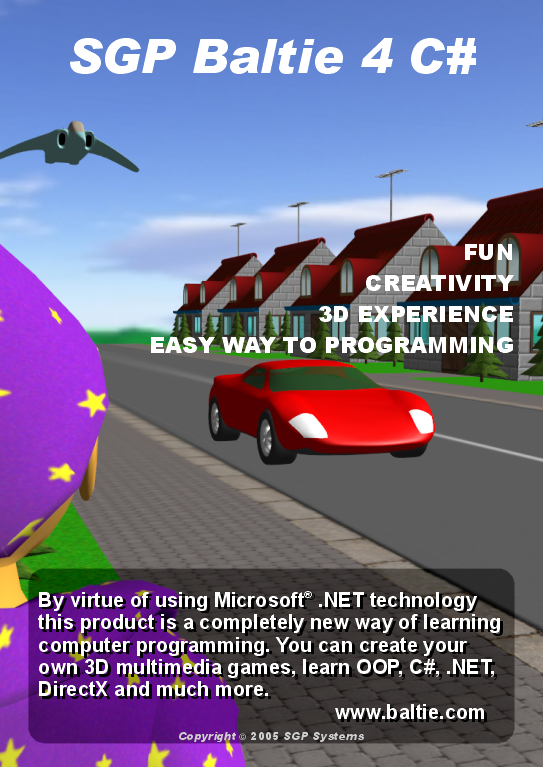 A friendly object-oriented programming teaching tool children, youth and adults, based on C#, DirectX and .NET. Also contains powerful 3D graphic library (SGPRTL). This tool is the ideal starting point for everyone who wants to learn an object-oriented and multithread	programming (in C#) and to develop attractive 2D and 3D multimedia applications.